In 1970, after labouring for eight (successful) years to promote recognition of Dr. Immanuel Velikovsky’s work, I came upon the work of the British catastrophist writer, Comyns Beaumont. I was puzzled that his name had not come to light during my many talks with Dr. V. Nor did it appear while I was president of Cosmos and Chronos: Study Groups for Interdisciplinary Science, a Velikovskian campus-oriented effort. Nor did it show up in the many activities and debates on V’s behalf. It wasn’t until I was cast free of the Velikovskians, and pursued my own studies of catastrophism, that I accidentally came upon The Riddle of the Earth, the first of Beaumont’s five books of a new catastrophism. Its title was the attraction, but its contents proved to be even more magnetic. The book is written in the form of theses (over 100 of them), summarizing his thoughts on cometary catastrophe. Written in 1925, it read like the 1950s bombshell Worlds in Collision. One of Beaumont’s central propositions took my fancy – that geography had been falsified in the fourth century, and the Old Testament holy city, Jerusalem, was really Edinburgh, Scotland. This falsification was a deception promulgated by Constantine the Great in 325 AD, at the Church Council of Nicea. The Church then carried on a conspiracy to protect the deception in order to guarantee its dictatorial rule over the Empire, and built a new city of Jerusalem in the Mediterranean. 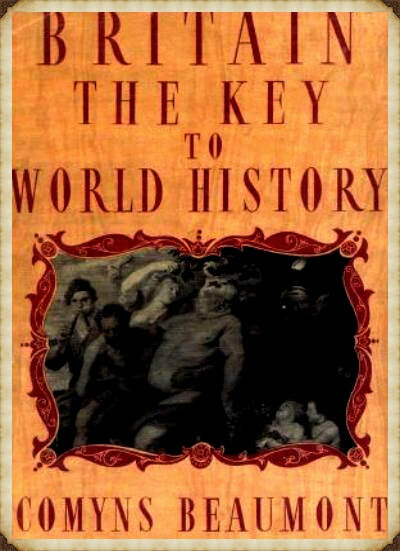 Another shocker for me was the role Beaumont assigned to the planet Saturn, as the key to world history. Thoroughly intrigued, I searched for the true and the false in his basic ideas. Beaumont’s books, unlike V’s, however, were long relegated to library morgues, and it took much persistence to acquire them. After considerable transatlantic correspondence and telephoning, I located one of Beaumont’s daughters and a real treasure trove of information – an unpublished manuscript that Beaumont completed before his death…Beaumont was ahead of his time – and ahead of Velikovsky – with his provocative conclusions and his unorthodox views on history. According to Beaumont, a large comet threatened Earth in the 14th century (1322 BC). Its debris (meteorites) caused a cosmic catastrophe that devastated early civilization, then centred in the Atlantis of antiquity – the British Isles. Plato’s story of Atlantis, and the Biblical account of the flood of Noah, were special attempts to record this disaster. The catastrophe so shattered the cradle of humankind’s earliest civilization that it immutably altered the religious beliefs of its survivors, who fled to the global Atlantean colonies in sunnier climes, themselves to become nations. Beaumont was an improbable heretic. In the years before and after WWI, he was a top-flight journalist, editor, and publisher on London’s famed Fleet Street, dealing primarily with politics, the arts and society. he was well connected in these fields due to his early work as assistant to publisher-diplomat James Gordon Bennett. As private secretary to America’s U.S. Ambassador to Germany, John G. A. Leishman, he traveled to many countries, acquainted himself with their customs and histories. He was confident and brother-in-law to the British playwright and theatrical producer Gerald Du Maurier. Beaumont was the first to recognize and publish the fiction of his talented niece, Daphne Du Maurier. A consummate establishment insider, Beaumont passionately pursued a parallel maverick career, developing ideas that challenged orthodoxy without relying on any of the divine intervention that is the backbone of contemporary Creationism and Biblical catastrophism. His ideas challenge accepted views of ancient history, its chronology, and its geography. The crux of Beaumont’s schema is that the history of our planet, and the solar system within which it exists, is largely the product of cometary intrusions and their effects. Its social life (civilization) arose with the Celts in the north, especially in the British Isles and Scandinavia – the Atlantis of myth. Although there was no actual sinking of Atlantis – Britain, some of its western areas were permanently submerged and the island was ravaged by electromagnetic waves of cosmic energy, exploding volcanoes, earthquakes, hurricane storms, and tidal waves. As a result of the catastrophe, the temperature dropped. Beaumont identifies the main agent of this historical event as the planet Saturn (Zeus-Chronos) becoming a comet, in myth, the serpent of the sky, and Phaeton, the terror of the skies. Its ravaged body produced a son, a new planet = a new sky god, Jupiter (a new Zeus), to rule a renewed Earth. Those familiar with the writings of Immanuel Velikovsky might well lock onto certain key features in Beaumont’s corpus and conclude, perhaps with a dismissive yawn, “Oh, Beaumont agrees with Velikovsky.” But “agrees with” is hardly the case. By the end of WWII (he was then in his 70s), Beaumont’s journalism career was over and he began work on distilling his theories of catastrophism and even more revolutionary conclusions about history and geography. Beaumont’s next to books, the first and second volumes of his trilogy, followed rapidly (1946, 1949). Neither were commercial successes. Beaumont completed the third volume before his death in 1953. Again note that all but the last of these books were published before V’s Worlds in Collision made its impact on this side of the Atlantic in 1950. In the years I was closely associated with V (roughly 1961-1969), he never mentioned Beaumont or gave him so much as a credit in a footnote in any of his books. The similarities between Beaumont and Velikovsky are too strong to be coincidental. It is Saturn’s role in earliest history that provides Beaumont a “smoking gun” for this judgment. There are, however, a number of cases of parallel development of ideas on record. Perhaps the most famous is that involving Charles Darwin and Alfred Russell Wallace, who both independently developed the main features of what has become known as the Theory of Evolution in the nineteenth century. It therefore came as a shock when I finally discovered that V did indeed know of Beaumont’s earlier work. The disclosure came with the publication of Cosmic Heretics by Alfred deGrazia in 1984. DeGrazia was long one of V’s closest collaborators and friends, and a continuing acquaintance and correspondent of mine dating from my own contact with V.
Too many of Beaumont’s conclusions are the same to explain them as sheer coincidence…A note exists in his archive, mentioning having read Beaumont’s 1932 book (The Mysterious Comet); the note dismisses the work. Yet V expresses his wonder whether Beaumont had gotten his (V’s) ideas by telepathy. During the 1940s, V met with the (Beaumont) books at Columbia University Library where he spend thousands of hours in research on his own books. The Columbia University Library possessed of Beaumont’s relevant works only The Riddle of Prehistoric Britain which was published in 1946. By this time Worlds in Collision had been written. DeGrazia’s candor in revealing the link is admirable, but his apologetics leave a lot to be desired in terms of credibility. Telepathy? I wonder if that happy thought crossed Darwin’s mind. Forgotten? Everyone who knew V, deGrazia included, has attested that V had a remarkable memory. What about the claim that V’s research haunt, the Columbia University Library, contained only Beaumont’s 1946 book, and that the manuscript for Worlds in Collusion was already complete at that time. Even deGrazia admits that there was a note that V had read Beaumont’s seminal 1932 book. And V was well known as the last-minute tinkered with his manuscripts. Let us also admit that, like many from academia, V had an elitist mindset, hindering him from appreciating the work of the amateur. Enough here, at least, to withhold credit and precedence. This much is certain. Beaumont’s ideas on the importance of comets in humankind’s history were in print before Velikovsky’s – although in a foreign country and without achieving the temporary popular success that was to be Velikovsky’s. Especially apparent, thanks to deGrazia’s revelations, is that V was aware of Beaumont’s work. V’s belief in his own originality was so firmly rooted that he speculated that telepathy was enabling Beaumont to rush into print – by decades in some cases. There is an even more intriguing possible reason for V’s failure to acknowledge the existence of Beaumont. This is not the similarities but the many dissimilarities between the writers. Why call attention to a contemporary (until his death in 1953) who not only precedes you in areas of agreement but disagrees with you on many other points? But that is speculation. What is clear is that forty years after his death, Beaumont deserves a wider audience in an era when fresh evidence for catastrophism is steadily accumulating. An important element of Beaumont’s work that will endure and serve to remind us is that the pursuit of knowledge is not the exclusive of the expert. The amateur can contribute significantly to that pursuit. For the last twenty years I have accumulated evidence to support Beaumont’s perspective of ancient history as truer than the consensus version or Velikovsky’s. One of Comyns Beaumont's extraordinary masterpieces revealing a thesis that few if any academic historians will want to endorse and broadcast. According to Beaumont, the vast majority of the characters and events presented in the Old and New Testaments did not geographically live or occur where most scholars and laymen believe. The theater was not the Middle East or Asia Minor, but Britain. It was only through deliberate chicanery, orchestrated by powerful potentates such as Constantine the Great, and others, that this fiction has been universally propounded and accepted. When it comes to facts proving the established paradigm, we find little to convince us. What elements of civilization are to be found east of Vienna got there due to the presence of the illustrious Hyperboreans or Arya (the original Ibaru or Hebrews). It is their lore and traditions that were cannibalized, corrupted, repackaged and resold in the form of Hinduism, Christianity, Judaism, Islam, Masonry, Hermeticism, etc.